The Des Moines Register this morning has an ad for a Spa, Swim Spa, Pool and Sauna Show in Hy-Vee Hall at the Iowa Events Center this weekend. This might be an opportunity for you to get that spa, hot tub and/or pool you’ve always wanted! Check it out at www.poolandspashow.com. And, while you might not find exactly what you are looking for there, you may also want to consider the many local suppliers such as the Rec Room Plus, WCI Pools and Spas, Hot Spring Spas, Swimming Pool Supply Company, and/or Central Iowa Pool & Spa. Somewhere out there you’re sure to find the perfect water-based play or spa area for your outdoor living space. If Santa can fit it down your chimney, it could make an awesome Christmas present for your family! The pool will likely need to wait for late-spring enjoymnent, but hot tubs and spas can be enjoyed year-round. Hot tub decks, spa decks and pool decks are very prevalent here in the Des Moines area and we have many in our Archadeck portfolio. One of the first surprises I found when I got into this business was how many pools there actually are in the Des Moines area. I am continually reminded of that in this business, particularly with the number of new pool installations I’ve seen over the past few years. It is yet one more example of how outdoor living spaces are becoming more of the focal point of a home…and one of the most enjoyable and valuable additions you can make to your home. Having seen all these, having a hot tub integrated with my own deck and doing what I do for a living, I thought I would share some Archadeck insight to pools, hot tubs and spas here as they relate to integration with your outdoor living spaces. I would also encourage you to work with an outdoor living space designer, such as Archadeck of Central Iowa, when considering a pool or hot tub or spa for your outdoor living areas. Careful planning and design of the entire space will ensure the most value and most enjoyment and the least amount of “headache.” Particularly with a pool, but even with hot tubs and spas, its important to do it right the first time. All this does take time, so if you do want to enjoy the pool, particularly, early in the summer, its not too early to start the planning and design now…or very early in 2010. In-ground pools are generally accessible and surrounded by a patio of some hardscaping material. Solid, smooth surfaces around the pool are generally best, so concrete lends itself well around in-ground pools. But, our Des Moines area clients also often incorporate decks, enclosures (screen porches, open porches) and pergolas around their pool and patio area as well. 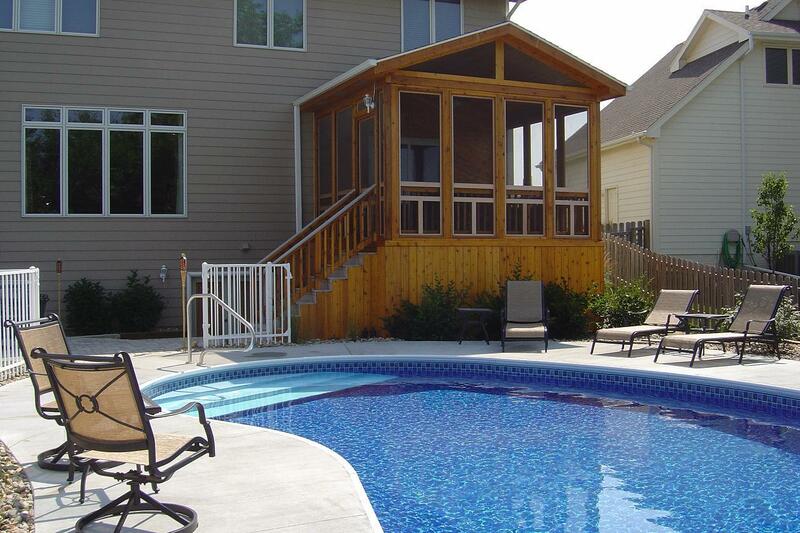 Above-ground pools are generally accessible and surrounded by deck structures. Often, we recommend and our clients prefer to integrate their pool deck with the primary deck structure that comes off the house; these are generally at different levels. This then presents nice opportunities to design unique, yet functional, multi-level deck structures into your outdoor living space. Whether in-ground or above-ground, the sheer amount of space (square footage) that needs to be covered to access and enjoy the pool. Whether its covered in concrete or other hardscaping or whether its decking material, the cost of that material multiplied by the space you need or want to cover often takes people back. If it’s a deck structure around your pool…or to your pool…a good portion of that deck needs to be what we call “free-standing”…in other words, not attached to the house….and certainly not to the pool. There is significantly more structural material (load-bearing posts (and their associated footings) and beams) around pool decks than any other type of deck we build. How much more is dependent on how much of your pool you want surrounded by the deck. This additional structure makes the relative cost per square foot of a pool deck higher than a traditional, house-attached deck. cover/lid operation…which way will it open/fold? what “view” do you want to have when you’re in the spa…what do you (not) want to be looking at? year-round usage – you’ll be warm in your hot tub and in your house in the winter…but what about that space in between? Lastly, regarding hot tubs and spas being placed on a deck structure, it’s important that the deck be structured to support the excessive load the hot tub or spa will place on the deck. 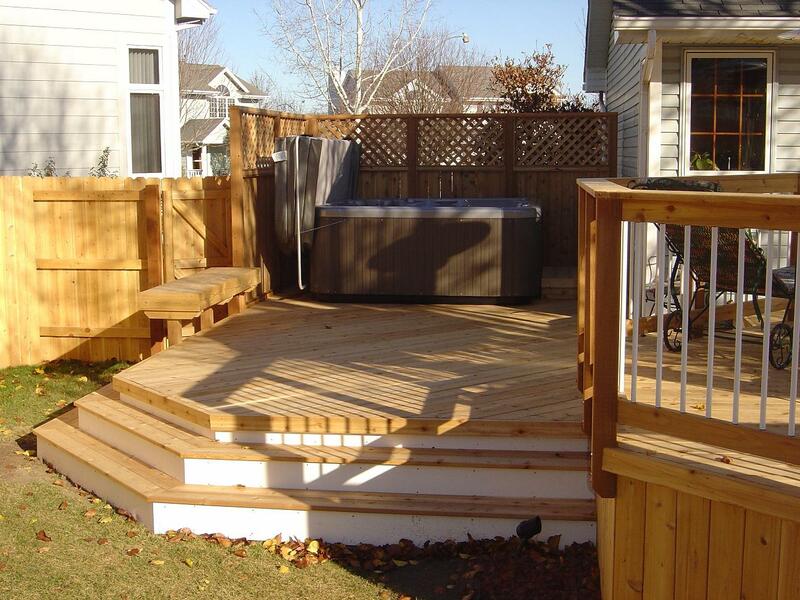 Most existing decks are not structured to support the load of a hot tub. In fact, too many existing decks are not even structured to support the load of normal usage…but that’s another story for another day. The worst mistake you could make would be to go to this show this weekend…or any weekend, buy a hot tub, have it delivered and installed on your existing deck – as is, run out later to enjoy the spa…only to have it all come crashing to the ground. I doubt few would make that mistake. But, the point is to have your deck structure thoroughly inspected and structured for the load the hot tub or spa will add to your deck. Consult with your hot tub/spa dealer and a reputable deck builder like Archadeck before installing a spa on any existing deck. In fact, I would even recommend doing that before you purchase the hot tub so you understand the full costs associated with your hot tub. 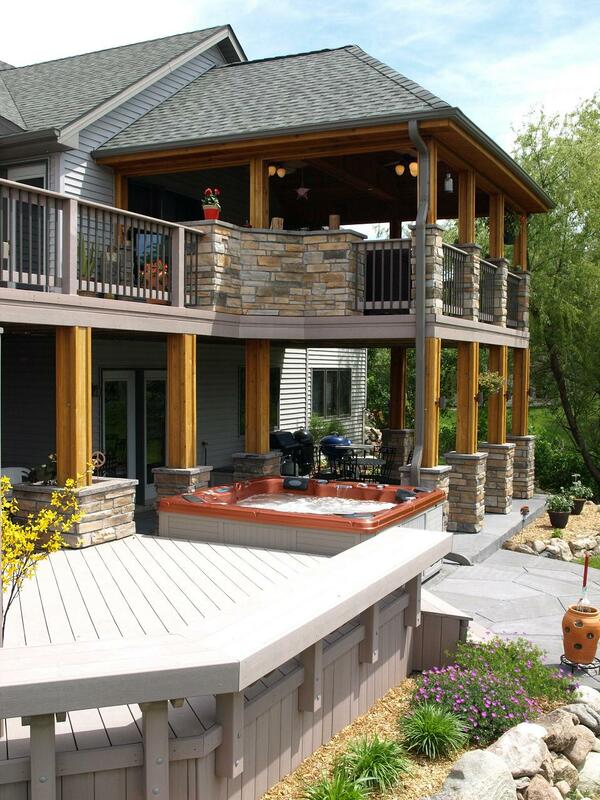 Pools, hot tubs and spas can be wonderful additions to your home’s outdoor living spaces. Check out the Spa, Swim Spa, Pool and Sauna Show in Hy-Vee Hall at the Iowa Events Center this weekend (www.poolandspashow.com) and/or any of the local dealers mentioned above anytime. Then, make a splash with Archadeck, your premier hot tub deck, spa deck and pool deck builder in Des Moines and Central Iowa areas. In addition, our screen porches, sunrooms, open porches, pergolas, patios and gazebos can all be configured for a pool, hot tub or spa or to be yet another integral aspect of your overall outdoor living space. This entry was posted in Pool and Spa Decks. Bookmark the permalink.